STAY AT HOME MOM: WW #82 "Horseback Riding"
About 3 weeks ago, on one of my Camera Critter posts,I mentioned my daughter was going horseback riding with her Girl Scout troop. Well I just received some pictures from her troop leader the other day. Visit Wordless Wednesday , 5 minutes for Mom, 7 Clown Circus, Sunnymama & Mom Dot for more participants. How fun!! I remember going horseback riding in girl scouts. How fun that she had that chance! I enjoyed that myself. Fun! I haven't been horseback riding in years and years. I miss it. Great photo! It looks like she had a fun time. I've never been on a horse. Great photo! It looks like she had a great time riding the horse! That's so cool. We live by so many farms with horses that everytime we drive by one my daughter says she wants to take up horse back riding. :) Happy WW! Great fun! 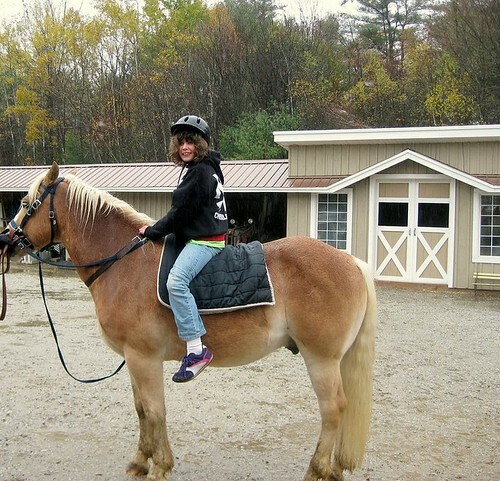 My daughter used to go horseback riding in the girl scouts at a local farm. Good times! Good to see they gave her a helmet. :) Horses are fantastic! I love how crisp the photo is!